The Iowa 4-H Program’s State Science + Technology Fair of Iowa (SSTFI) serves as a platform for student researchers (grades 6 – 12) to meet with professional researchers and communicate their findings and understanding of the research process. The SSTFI is an affiliate of the Intel International Science and Engineering Fair. 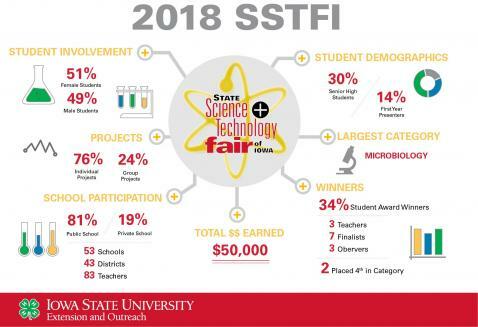 The State Science + Technology Fair of Iowa is OPEN to ANY student (grades 6-12) residing in or attending school (public, private, parochial and home school) in the state of Iowa. At this time there is NO qualifier fair (local, conference, district or regional) required for participation! Check out pictures from SSTFI 2019!